ARTIS – Naples: 5833 Pelican Bay Boulevard, Naples, FL 34108 MAP (239)597-1900 artisnaples.org 2018-19 Season Performances of the Naples Philharmonic Jazz Orchestra (Glenn Basham (coordinator and violin), Lew Del Gatto (artistic director, co-bandleader and tenor saxophone), Jerry Stawski (co-bandleader and piano), Mike Harvey (drums), Kevin Mauldin (bass) and Dan Miller (trumpet). APR 24: Naples Philharmonic Jazz Orchestra Featuring Veronica Swift, vocalist; MAY 15: Naples Philharmonic Jazz Orchestra - The Music of Cannonball & Nat Adderley. Concerts at 6pm and 8:30pm. Subscription and Ticket Info; 22: Dan Miller with The Naples Philharmonic Youth Jazz Orchestra End of Year Concert Concert.7pm. TICKETS. Barrel Room at the Twisted Vine Bistro: 2214 Bay Street, Fort Myers, FL 33901 MAP barrelroomfortmyers.com (239)333-2225 Every Thursday, 7pm-10pm: The Dan Miller - Lew Del Gatto Quartet w/ Dan Miller (trumpet), Lew Del Gatto (tenor saxophone), Brandon Robertson (bass) and Tony Vigilante (drums). APR 26: Marty Stokes Band, 9pm-midnight; MAY 25: Marty Stokes Band, 9pm-midnight. Big Blue Brewing: 4721 SE 10th Pl, Cape Coral, FL 33904 MAP bigbluebrewing.com (239)471-2777 8:30-11:30pm, MAY 10: Marty Stokes Band; JUL 13: Marty Stokes Band; AUG 30: Marty Stokes Band; SEP 13: Marty Stokes Band. Blue Monkey: 7550 Mission Hills Drive, Naples, FL 34119 MAP facebook.com/TheBlueMonkeybarandgrille (239)597-2583 8:30-11:30pm, APR 20: Marty Stokes Band, 8-11pm; MAY 18: Marty Stokes Band, 8-11pm; JUN 22: Marty Stokes Band, 8-11pm; JUL 20: Marty Stokes Band, 8-11pm; AUG 17: Marty Stokes Band, 8-11pm; SEP 21: Marty Stokes Band, 8-11pm. Castaways Bar & Grill at Santini Marina Plaza Shops: 7205 Estero Blvd, Fort Myers Beach, FL 33931 MAP (239)463-4644 fortmyersbeachmusic.com MAY 24: Marty Stokes Band, 8ppm-12am; JUN 28: Marty Stokes Band, 8ppm-12am; JUL 26: Marty Stokes Band, 8ppm-12am; AUG 23: Marty Stokes Band, 8ppm-12am; SEP 27: Marty Stokes Band, 8ppm-12am; OCT 25: Marty Stokes Band, 8ppm-12am. Englewoods on Dearborn: 362 West Dearborn St., Englewood, FL 34223 MAP englewoods.tripod.com (941)475-7501 7-10pm, APR 16, 17: Rev. Raven & The Chain Smokin’ Altar Boys featuring Westside Andy; MAY 9: Lauren Mitchell w/ Sugar & Spice; 23: Ruth Wyand. George & Wendy's Sanibel Seafood Grille: 2499 Periwinkle Way, Sanibel, FL 33957 MAP sanibelseafoodgrille.com (239)395-1263 9pm-midnight, APR 19: Marty Stokes Band, 9pm-midnight; MAY 17: Marty Stokes Band, 9pm-midnight; JUN 21: Marty Stokes Band, 9pm-midnight; JUL 19: Marty Stokes Band, 9pm-midnight; AUG 16: Marty Stokes Band, 9pm-midnight; SEP 20: Marty Stokes Band, 9pm-midnight. Leroy’s Southern Kitchen & Bar: 201 W Marion Ave, Punta Gorda, FL 33950 MAP (941)505-2489 leroyssouthernkitchenandbar.com APR 27: Marty Stokes Band, 9pm-midnight; MAY 30: Marty Stokes Band, 9pm-midnight; JUN 27: Marty Stokes Band, 9pm-midnight; JUL 25: Marty Stokes Band, 9pm-midnight; AUG 31: Marty Stokes Band, 9pm-midnight; SEP 26: Marty Stokes Band, 9pm-midnight. Little Bar Restaurant: 205 Harbor Place, Goodland, FL 34140 MAP littlebarrestaurant.com (239)394-5663 MAY 10: Lauren Mitchell; 11: Marty Stokes Band; 25: Ruth Wyand; JUN 8: Bridget Kelly Band. 8-11pm. North Naples United Methodist Church: 6000 Goodlette Rd Naples, FL 34109 MAP northnaplesumc.com (239)593-7600 MAY 3: NEW ORLEANS JAZZ WITH AWARD-WINNING TRUMPETER - LEROY JONES WITH LEW DEL GATTO - FAMED SNL SAXOPHONIST and Dan Miller. 7pm, TICKETS. Roadhouse Cafe: 15660 San Carlos Blvd, Ste 36, Fort Myers, FL 33908 MAP (239)415-4375 www.roadhousecafefl.com. 7pm-10pm every Tuesday: Dan Miller Quartet featuring Jerry Stawski. Saint John the Evangelist Catholic Church: 625 111th Avenue North, Naples, FL 34108 MAP (239)566-8740 saintjohntheevangelist.com MAY 9: The Dan Miller - Dan Heck Quartet w/ Dan Miller (trumpet), Dan Heck (guitar), Brandon Robertson (bass), Paul Gavin (drums). FREE ADMISSION. 7pm. Shark Bar & Grill FMB: 17979 San Carlos Blvd, Fort Myers Beach, FL 33931 MAP (239) 313-6012 facebook.com/pg/sharkbarfmb JUN 16: Lauren Mitchell, 5pm, No Cover. South Street City Oven and Grill: 1410 Pine Ridge Rd, Naples, FL 34108 MAP southstreetnaples.com (239)20435-9333 TBA . Tiburon Golf Club at the Ritz Carlton Resort: 2620 Tiburon Drive, Naples, FL 34109 MAP (888)613-8488 Naples "Stay In May" Festival APR 27: Dan Miller with Alex Laurenzi and Lew Del Gatto: Dan Miller (trumpet), Alex Laurenzi (alto saxophone), Lew Del Gatto (tenor saxophone), Richard Drexler (piano), Brandon Robertson (bass), Marty Morell (drums). 6pm. TICKETS. Wang Opera Center: 2408 Linwood Avenue, Naples FL 34112 MAP (239)963-9050 capacenter.org . MAY 8: The Naples Philharmonic Youth Jazz Orchestra CAPA Concert w/ Dan Miller (Director), 7:30pm. TICKETS. 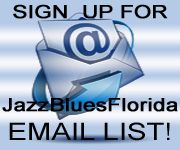 © Jazz & Blues Florida - Florida's Online Guide to Live Jazz & Blues Music, 2019. All Rights Reserved.